NOT APRIL FOOLS: FREE XBOX ONE ULTRA UPDATE! Happy April 1st, members of the Super Time Force! Today we’re happy to announce that we’ve bent space-time in a way that has allowed us to provide a FREE ULTRA UPDATE for all Xbox One players! This update brings you the Helladeck, 50 new super fun challenge levels that will force (pun intended) you to use your time-rewinding brain in a different way. The Ultra update also brings you the Ultra Force mode, an alternate style of time-forcing with extra-powerful, extra-asplosive versions of the Time Force team. But you gotta beat the game before you can wield this Ultra power. Oh and we added some pretty challenging achievements as well, for all you hunters. We’d like to thank everyone who has supported our crazy time-traveling platformer on Xbox One. Did we mention this big update is free? Cause it is. Go forth and Ultra! KOOKABUNGA! NOTE: This is not an April Fools joke. Trust us. Your Xbox One is probably updating it now! HUGE SALE ON EVERYTHING CAPY! 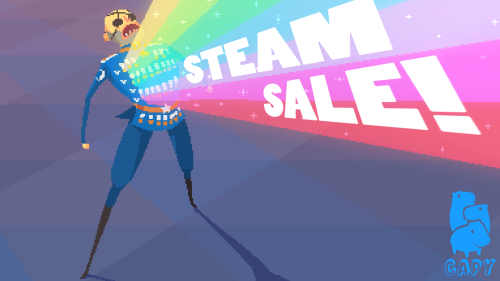 We’re having a HUGE SALE on ALL THINGS CAPY! GO HAVE FUN PLAYING OUR VIDEO GAMES PLEASE & THANKS! SUPER TIME FORCE ULTRA = 35% OFF! SUPERBROTHERS: SWORD & SWORCERY EP = 60% OFF! CRITTER CRUNCH = 66% OFF! CLASH OF HEROES = 40% OFF! #SWORCERY iOS = 60% OFF! #SWORCERY ANDROID = 70% OFF! Enjoy! + Happy Thanksgiving + KOOKABUNGA!!!!! STFU ON STEAM ADDS TF2, L4D CHARACTERS! Light’em up! Pyro from Team Fortress 2 dials the heat to 11, then rewinds and dials it to 12. Destroy evil robots with the flare gun, or roast them good with the patented Pyro flame thrower. She’s got two pistols and an endless supply of propane tanks. 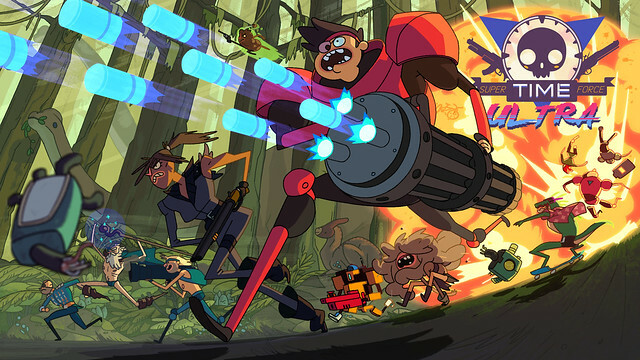 Zoey from Left 4 Dead has taken a break from slaying zombies to hop through time with the Super Time Force! Blast baddies with twin handguns, or lob an explosive propane tank their way for maximum ‘splodiness. When he’s not jumping from planes without a chute, wrastling gators, or beating up hippies, Team Fortress 2′s Saxton Hale tags along as the Super Time Force’s resident brawler/business man. Saxton uses his massive muscles, bare knuckles and self-confidence to smash Blounbot’s into a metal pulp. Then he rewinds and does it again. All three Valve characters, along with 50 new Helladeck challenge levels and the new Ultra Force power mode are available in Super Time Force Ultra for $14.99 when it launches on Steam August 25th. Want to see theses new characters, plus the other new STFU features in action? Head over to CAPY’S TWITCH and watch the crew livestream all this amazing stuff later today. SUPER TIME FORCE ULTRA LAUNCHING AUGUST 25! Super Time Force Ultra is coming to Steam on August 25th! STFU brings all the insane time-travel action of Super Time Force to PC along with brand new bonus content including: 50 new Helladeck challenge levels, inter-dimensional Ultra Force powers and 3 super-awesome, super-secret new characters! STFU is the ultimate in personal computing time travel technology!